Tuesday 1st September and Wednesday 2nd September are Staff Development Days. All Year 11 pupils MUST REPORT TO THE ATRIUM AT 6:30pm on Wednesday 1st July 2015. Pupils will be transported by coach to The Devonshire at 7:00pm. The coaches will return from The Devonshire at midnight. The school is being inspected by Ofsted on Wednesday 24th and Thursday 25th June 2015. Please find below some supporting information on the inspection process, and guidance on how to access the Parent View portal. Owen Sandford, Hannah Phillps, Alex Woolley Carrol, and Abbie Humphreys attended a Salters Chemistry Festival and Liverpool John Moores University. 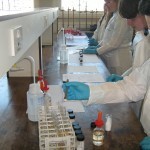 The four pupils worked collaboratively to complete a number of different Chemistry investigations, competing against other schools in the North West. The pupils worked as Forensic Investigators to piece together evidence to solve a mystery crime. The festival provided the pupils with an insight into the world of Chemistry by carrying out Paper Chromatography, Salt Tests, and testing unknown Acid & Alkalis. The day ended with the pupils competing in a University Challenge, testing their knowledge of Chemical Reactions. 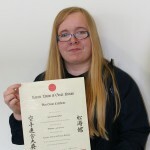 Jodie Garner Jones (Year 9) joined the Kirkby Karate club in May 2010. Since then she has received numerous medals and titles. Jodie gained her first Silver medal in the KYU grade Karate championships in 2014. She added to her trophy cabinet in the KYU Northwest Karate Championships with a Bronze medal in Feb 2015 . Jodie was also Silver Medalist this year in the 12-15 2015 Northwest Karate Championships. On April 26th 2015 Jodie achieved her Black Belt which she dedicated to her late Mother Stephanie Garner Jones who sadly lost her battle to Bone and Breast Cancer on 16th November 2014. We are so proud of Jodie and her achievements. Jodie’s work ethic and emotional resilience are simply inspirational. Since taking up the Principal’s post at All Saints on Monday 20th April I have received a warm welcome from so many of you and would like to take this opportunity to thank you. When students, parents, staff and governors work in close partnership they build a strong learning community and a successful school. An essential feature of all successful schools is the very highest standard of behaviour. I am passionate about creating the positive learning environment where all are expected to work hard, behave well and achieve. To bring this about I have established a working group to consider a new behaviour policy. Integral to this is the voice of both pupils and parents. The group will make its recommendations before May half term and I know I can rely on your support when the policy is implemented on Monday 1st June. Having reviewed the school calendar I have made a change to the schedule. Monday 1st June will now be a teaching day for all students and not a staff INSET day. Year 11 students will particularly benefit from this additional teaching day as they will have commenced their GCSE examinations. As a consequence of this change school will now finish this academic year on Monday 20th July. The Summer term has started positively and I envisage a school that will strive to improve and will do so year on year. Our strong partnership is essential and will underpin future achievements. I grew up in Kirkby and was educated at St Kevin’s so my affinity with the community is deep rooted. 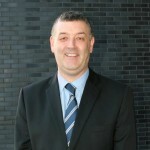 As your new Principal I am determined to establish All Saints as a thriving learning community where students achieve their potential and All Saints becomes the first choice secondary school for all Kirkby parents. The Clerk to the Governors will be writing to parents/carers early in June to inform you of a Parent Governor vacancy and the process of election. Once again thank you for the very warm welcome I have received. I look forward to working in close partnership with yourselves over the coming years.